These first few posts are going to be pretty factual just so I can get some of the basic principles out of the way. A lot of these posts might be turned into pages when I start to cover more niché topics! This first concept is a bit abstract, but important: I’m going to explain what atoms are and how they make up our world on a really tiny scale, using Lego as an example. If you found a well built Lego house you could easily admire and recognise each of the different areas. But if you looked closely enough you would see that the house is made of individual Lego bricks. Each little piece stacked on top of another to make a finished and recognisable product. This is how the world is built. Everything is made of smaller parts which join together to make something we know, like a house or a bicycle or even a human. In general atoms are the Lego bricks that make up this world (the word atom comes from the greek atomos meaning: something that can’t be made smaller. This is wrong as there are particles smaller than atoms, but that’s a topic for another post). Like lego there are many different types of atoms (they are separately known as the elements and are all listed in the periodic table). Some are different sizes, some fit together (while others don’t) and a few are even different colours. 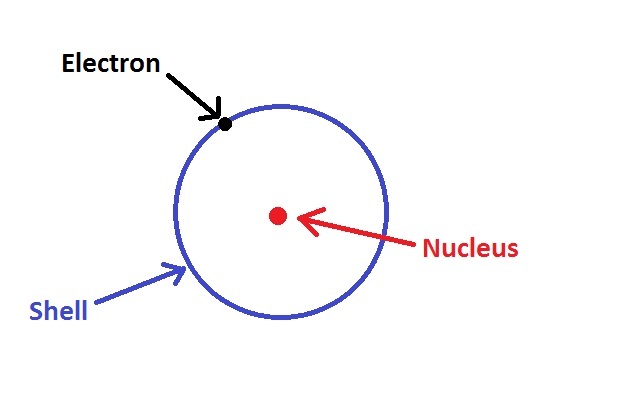 The red centre is the nucleus containing protons and neutrons. The blue outer layer is the shell which contains the electrons. Different atoms tend to have different numbers of electrons, protons and neutrons. 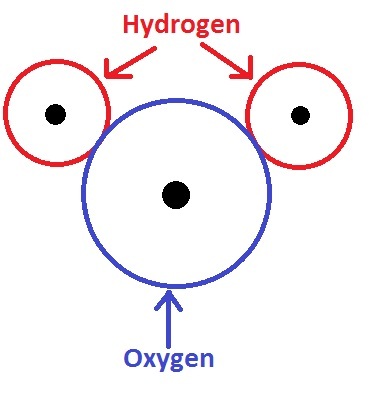 For example Hydrogen (the smallest type of atom) has one electron, one proton and no neutrons, whereas Oxygen (a larger type of atom, and number eight in the periodic table) has eight electrons, eight protons and eight neutrons. So atoms are like bricks of Lego. All you have to do to make something recognisable is fit them together. Once you have a combination of atoms stuck together they become a molecule. One well known molecule is water, often referred to as H2O (meaning two hydrogen atoms, H2 and one oxygen atom, O). If we put more and more of these water molecules together we could make a puddle or even an ocean. If we put more of these Lego shapes together we could make a massive brick wall. If we took a different combination of atoms we could make different molecules. Then if we combine different molecules you can make loads of different products like sand or oil. – In one millilitre of water (roughly a drop of water) there is 33,000,000,000,000,000,000,000 or 33 sextillion molecules of water. – As there a 3 atoms for each molecule of water (two hydrogen atoms and one oxygen atom) there is a total of 99 sextillion atoms in 1 ml of water. – The average glass of water is 250 millilitres. – Atoms are tiny, but almost everything in the universe is made from them. – When you stick two or more atoms together you make a molecule. – It takes a lot of molecules and atoms to make something that we can see or touch. Edit: I just found this nice little site: http://learn.genetics.utah.edu/content/begin/cells/scale/ which gives a good example of the size of an atom. Enjoy! the lego analogy is a good one! used it a few times myself to explain atoms and molecules to friends and family, seems to go down quite well. nice blog! It is a pretty awesome analogy. My only problem with it is that I then want to use it for other things like cells and enzymes… It’s too useful! Passing thought about “It takes a lot of molecules and atoms to make something that we can see or touch” – where among all those molecules and atoms can be found the undeniable experiences of seeing and touching? The senses are probably going to be included in one of my next blog posts as I move into Neuro. But yes… you’re touching on an area of physics that I have little understanding of. You look at a helicopter blade and it only takes up a few percent of your view. But if you move it fast enough, it’ll become all you can see. Electrons move pretty fast (probably speed of light) so the ‘shell’ that they encircle becomes more or less a solid object. That’s a purely amateur understanding though. Someone correct me if I’m wrong!